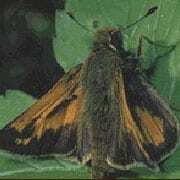 Upperside is yellow-orange with well-defined black markings. Black border of the hindwing is often toothed. Underside of hindwing is yellow-orange with a band of yellow spots that barely contrasts with the background.